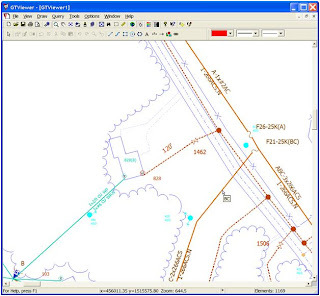 GTI has gained considerable experience with Intergraph’s G/Technology metadata through the development of our export tools that take GIS data out of Oracle and into the GTViewer format (which can then be used with GTViewer, Pocket GTViewer, and/or GTWeb). GTI’s G/Tech Exporter is now in its fourth generation and offers better support and flexibility for quickly and accurately getting graphic and tabular data out of a G/Tech database. The current incarnation of GTI’s G/Tech Exporter provides a full GUI interface, provides dynamic style and label rule evaluation, and automatically extracts style and symbology information. The Exporter is a heavy user of the G/Tech Metadata when exporting the GIS data, so it was a small leap for GTI to reuse some of this technology in a tool other than the Exporter, and the GTI Metadata Explorer was born. As many people who deal with G/Tech data know, Toad has been the tool of choice for navigating the G/Tech metadata. 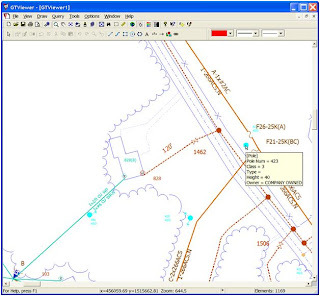 The G/Tech metadata contains all of the information describing the GIS and ranges from the list of features and their components, relationships between features, Display Legend info, to symbology. By using Toad’s Schema Browser or by executing home brewed SQL scripts, you can find anything you want to know in the metadata. And while I love Toad (I really do) and all it can do, and fully agree that this method of exploring the metadata is significantly better than what you could do with SQL*Plus or any of the G/Tech utilities, Toad doesn’t know anything about the G/Tech metadata or how the many tables interrelate. It should also be pointed out that Toad shouldn’t know these relationships because it is a database administration and SQL development tool, not a metadata viewer. And you still have to wade through the entire list attributes for the joined table results to get the information you need. 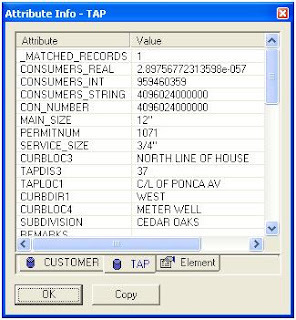 If you want to see all of the attributes for one of the tabular components, then SQL gets even more complicated. If you want to know the attributes for one of the feature’s tabular component, click on the tabular component in the list. If you have an attribute associated with a value list, click on the attribute and to get a list of the values. Another feature the explorer provides is a set of Validation routines. The correctness of certain aspects of the metadata can be verified. Style Rule, Label Rule, and Label Format validation routines are provided to test the correctness of the expressions used in the metadata rules. It turns out that there are quite a few mistakes in these expressions that G/Tech does not catch and these validation routines can quickly identify them. Other validation routines can detect Unreachable Rules. It is common to see in G/Tech data a list of rules for a feature where one or more rules have the same conditional expression. Obviously, something is wrong with these style rules because the first rule with the expression will always trigger the associated style and the duplicate(s) will never be reached. Legend Validation will analyze a legend’s hierarchical structure and verify that there is a leaf node for legend level of the legend. 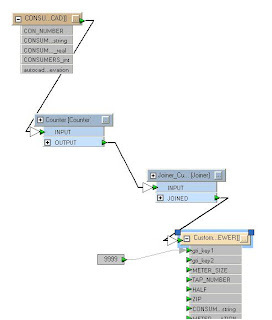 It is not uncommon to see 3 levels of grouping, but no features at the lowest node. Geometry Property Validation will search for obvious problems in a geometry table’s attributes. Whether these problems come from bulk data conversion when migrating from classic Framme data or from some other process, it is not uncommon to have poorly constructed geometry records in a G/Tech database. This validation is not technically testing metadata correctness since it is examining each geometry record in the database, but it is a useful test none the less. More detailed information about the validation routines will be in a later posting. One of the more interesting features of the GTI Metadata Explorer is the Summary Report feature. This report allows the user to select a set of features from a particular legend, then create a summary report for those features that will tell the number of times each style rule and label rule are used for the current data. This report is ideal for testing the integrity of both your data and metadata. For example, if you have no retired poles in your data, but the summary report show that there are 500,000 poles using the Retired Pole symbology, you know there is a problem that should be investigated. The report will also provide a quick and easy view of the usage of your style and label rules which is not something you can do by simply querying the database with Toad. This posting just gives a taste of what the GTI Metadata Explorer can do. More postings will be added later describing the features in more detail. The Explorer is currently a beta application, but if you would like to try it, please contact me (joey.rogers@gti-us.com), and I will get you started in the beta program. Version 7.0.x.20 of GTViewer is available. - FIX - Feature Tooltips were causing Data Monitor Tooltips to not display. - FIX - Feature Tooltips with multiple items where one or more items were blank would unnecessarily show the separator. - CHG - Feature selection tolerance was increased from 2 to 4. - FIX - If the GPS Components were not installed, bringing up the GPS dialog could cause unexpected results. - NEW - Options/Settings now has Selection Tolerance as a property so the user can adjust the tolerance level. Version 7.0.x.12 of GTVx is available. - FIX - Feature Tooltip Definitions were not cleared between opening files. - FIX - Feature Tooltips with multiple items where one or more items were blank would unneccesarily show the separator. The GTDataSum utility has been added to GTData. This new utility provides a summary report of the information in an ASCII Tabular File (data.txt) including a list of tables, the number of records in each table, and the size of each table in bytes. The summary report can be used to determine which tables are taking the most space and identify tables that could have non-essential attributes filtered out. Version 7.0.x.28 of the GTViewer .NET Control is available. Version 7.0.x.19 of GTViewer is available. - FIX - Feature Tooltip was causing redline drawing to behave incorrectly. - FIX - Reviewing Linked files with GTViewer would cause a problem. Version 7.0.x.11 of GTVx is available. GTViewer, GTVx, and the GTV .NET Control all received upgrades to their raster functionality. Updates to ER Mapper’s ECW file functionality include various enhancements and fixes as well as adding support for .ERS files (which provide header information in a simple ASCII format while pointing to a .ECW file). JPEG 2000 support has also been added. A .jp2 file can now be included in a non-Category raster list or a Raster Category’s raster file list. The .ERS file can also be used to specify header information for a .jp2 file. 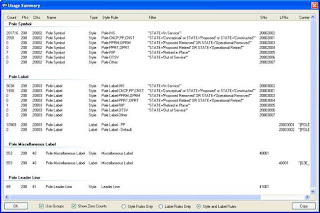 Including the LizardTech's MrSID format, the GTViewer family of products offers a wide range of Raster support making it easy to being in background imagery. 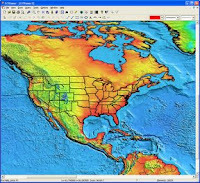 The screenshot above show the ER Mapper sample data composited with Country and State bounary shapes. Version 7.0.x.20 of the GTVControl is available. - FIX - #127 - Problem with Draw Area removing the last point in the area. - FIX - #126 - Fixes the the Draw Line and Draw Area commands. Finish Button did not take away the floating point and right mouse button did not work. - NEW - #124 - Upgraded ECW Library to version 3.3 and added support for .JP2 and .ERS files. - CHG - New License Key Scheme. Version 7.0.x.11 of GTViewer is available. - NEW - Relative link path will now check for URL type address before decomposing the path. Previously, only absolute link paths could be used. - NEW - Upgraded ECW Library to version 3.3 and added support for JPEG 2000 (.JP2) and .ERS files. Version 7.0.x.17 of the PGTV Control and GTVControl are available. - FIX - #123 - GPS indicator was erased during drawing and zoom in commands. - FIX - #121 - FindClosestColor would sometimes fail if a color table was not available in the data. - FIX - #120 - Overview map automatically suspends GPS updates. - NEW - #119 - SuspendGps property added. - NEW - #118 - A new method called GetSatelliteInfo was added to retrieve a list of current satellite information (azimuth, elevation, id, SNR). - NEW - #117 - A new method called TriggerGpsEvents has been added to cause all GPS events to be fired with their last set of values. Since most GPS events are only fired when a value changes, this method is an easy way to get all of the event to fire without waiting for values to change to get the events. - FIX - #116 - Placing text elements with the maximum number of character (1024) caused problems. - FIX - #114 - Coordinate Conversion did not allow for data being in a Lat/Long projection. - FIX - #122 - Problem with Graphics resource when GPS was updating. - FIX - #115 - ToLatitudeLongitude and FromLatitudeLongitude were not implemented. - FIX - #113 - GetFileProperties did not work. Version 7.0.x.4 of GTVx is available. - FIX - #C1001 - Text elements with 1024 character were causing problems. The text size limit is supposed to be 1024. - FIX - Complex Shape with Hole elements were having problems if the rendering points in neighboring shapes had the same start point. Pocket GTViewer version 7.0.x.5 is now available. - FIX - Placing text elements with the maximum number of character (1024) caused problems.